It’s been a rough couple of days for us, and I heavily debated with myself whether to write this post or not. I finally decided to write it, but as I write, I’m still undecided about posting it. Please read the ENTIRE post before jumping to conclusions or judging. Kyle and I are both emotional wrecks about this situation. Saturday (3/2/19) around 10pm, we had just finished watching a movie and I was going to use the head. We both heard an unusual sound outside the boat. Living in a marina, there can be all manner of odd noises from things bumping into each other or wind in rigging or people about. It’s a unique environment for sounds, so your ear gets tuned to what is ‘normal’ and what is not. This was not. Kyle went to investigate, then called for me to hurry as we had an issue. I got out to the dock to see a tiny baby harbor seal. He (we think?) was panicked, but oddly didn’t seem afraid of US. In fact, when Kyle would splash the water a bit, the baby would come over to him. He was obviously trying to get out of the water, but was too small to make it up to the dock or even up on the swim platform of the boat next to us. Kyle told me later that, when he first saw those eyes, the baby seemed to be pleading for help. Kyle (having been in the water so much of his life in various incarnations) and I both knew direct intervention is not usually the best course of action, but this baby was in such obvious distress there was just nothing else to do. Currently as a commercial diver, Kyle swims with harbor seals almost daily and know how smart they are. One herd that hung around a specific marina he was working in was acting odd, and he realized they were protecting him from a shark in the water near him. Not only did several of the seals keep ‘bumping’ Kyle to get him to move, they would ram the shark to keep it away. Once Kyle got out of the water onto the dock, all the seals hopped back up onto their sunning spots and went back to ignoring him. 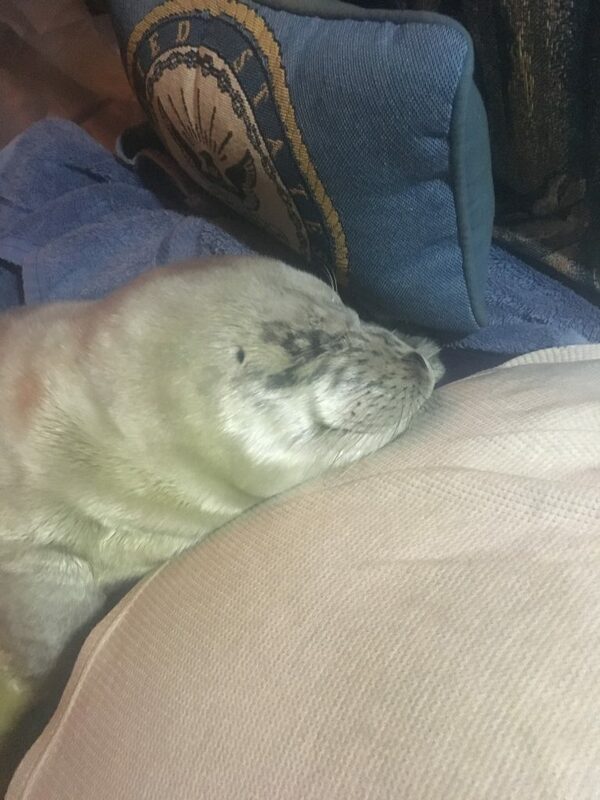 He also made friends with a seal up in Florence, OR…it would come ‘knock’ on the side of the boat to get his attention…so he has a good grasp of what these critters act like. I went to grab a bit of ham (don’t worry – he never had any…we honestly didn’t realize just how young he was at the time) to try to tempt him up out of the water, but when I came back out he had gone under and come up a couple of boats away. We went down to the end tie on our dock (just 3 slips down) and he was trying so hard to get out of the water and crying for his mom. 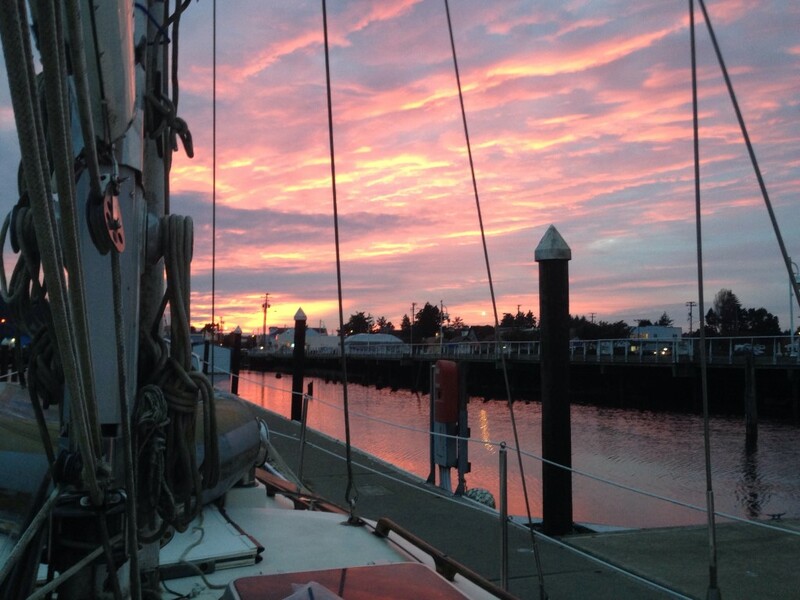 Kyle scooped him up onto the dock – NO resistance – where he just shivered and cried. Talk about a heart breaker. Kyle went to grab a towel while I soothed….no other seals anywhere in sight. No sounds no nothing, even with the baby crying. Kyle came back and we got him wrapped up and he snuggled against my leg. I kept petting and soothing, hoping mom would show up…Kyle wandered around the marina looking for her. Nothing. Had another seal come anywhere close we would have backed off and let them deal with it. 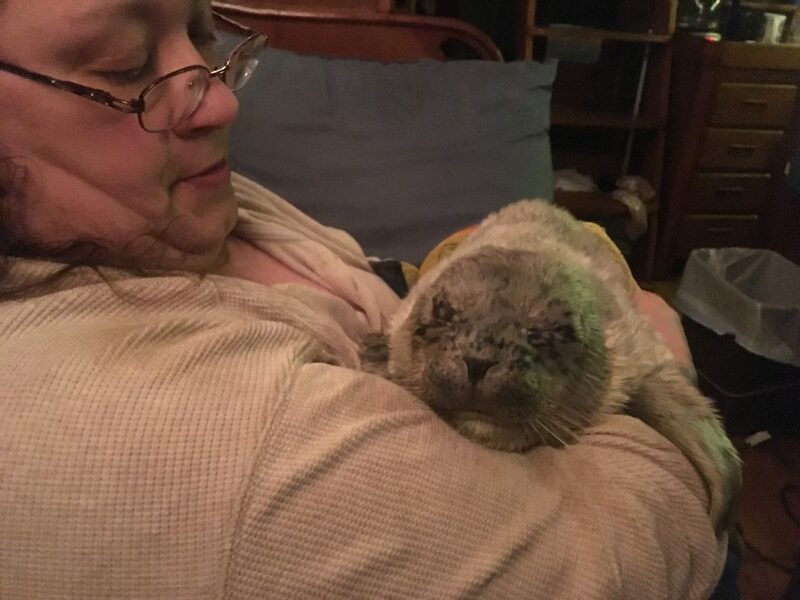 Finally about 10:30pm – Kyle phoned the Marine Mammal Rescue hotline. The first person we talked to was NOT helpful. She was in fact rather rude which didn’t help our stress about the situation. We were more than willing to drive this poor little critter anywhere it needed to go! Her comment was to just leave it be, they’d send someone in the morning and hung up. Grrrrr. So, Lil’ Bud (as we took to calling him) was scooped up and brought down into the boat. Now, before people flip out about distressing the animal – he was exhausted and snuggled into my chest. We had sat with him out on the dock for almost an hour waiting for mom…who was a no show (more about that later) and knew if we just left him there he WOULD die. When Kyle first saw him, he was swimming for all he was worth and barely keeping his nose out of the water. Kyle tried calling the sheriff’s department, while I held and soothed. They couldn’t do anything and suggested he try the MMR again. A much more helpful lady this time, genuine concern and she would do her best to track down someone to come get him. Keep in mind it is now 11pm – but she said she’d have someone get right back to us. She did remind Kyle a couple of times that this was a ‘wild animal’ – but it was hard to explain why that just wasn’t an issue. Lil’ Bud would crash, then rouse with a whimper or a small cry, then settle down again and crash. It just broke our hearts as we felt so helpless without having a clue what to DO for him other than keep him calm. One of the most poignant things he would do, if I put my finger on the underside of his front flipper, he would squeeze my finger with the flipper just like a human baby tends to do. Man. Around 11:30pm, Kyle tried again as we hadn’t heard from anyone. She was still working on it – she promised. Finally about 10 minutes later we got a call from a guy (I think his name is Ron – but not sure as I never talked to him and Kyle was pretty much a basket case for most of the calls) getting more information and figuring out how to proceed. The one person they could maybe call on for such a late pickup was actually sick, and had taken heavy amounts of cold meds and didn’t feel he should be driving. We offered to drive Lil’ Bud anywhere he needed to go, but Ron said that, as long as he was calm and comfortable it might be best just to leave him with us for the night. Kyle told him he was sleeping very peacefully and his breathing – which had been horrible when we first pulled him up on the dock – seemed to have leveled off. We were again warned that this was a ‘wild animal’. We knew, but as Kyle explained I seemed to be a surrogate mom at that point with the little guy crashed out across my body (I was laying almost flat for him). So instructions were to not have it too warm as he could easily overheat. Just keep him calm. We really couldn’t do anything for feeding so, let him rest and they would get someone out first thing in the morning. Our help was really appreciated given the circumstances and we were doing good things. So we made a ‘nest’ with towels and an old blanket up in the forward cabin – it’s a V-berth so just a small space on the floor, but it was cool and enclosed. Got him settled in there around 1am and we finally – after checking on him again – went to bed around 1:30am. I was up around 3am and he seemed ok. I got my finger under a front flipper and he gave it a good squeeze, shifted, sort of grunted at me for waking him then settled back to sleep. I felt like, maybe, we were passed the worst of it and really slept myself. I got up again right around 6am. Lil’ Bud hadn’t been gone long as he was still a bit warm, but he was definitely gone. I just let Kyle sleep – nothing he could do. So I cried by myself as quietly as possible for an hour or so till Kyle got up, then we cried together. That little creature really touched our hearts in just a few hours. MMR called around 8:30am – Ron again. When Kyle told him the news he said it wasn’t unexpected as those little guys are just so fragile at that stage and he would have someone come right away to get him. We got a lot of information when the lady finally showed up. Turns out the MMR center had received several calls about Lil’ Bud during the day Saturday. 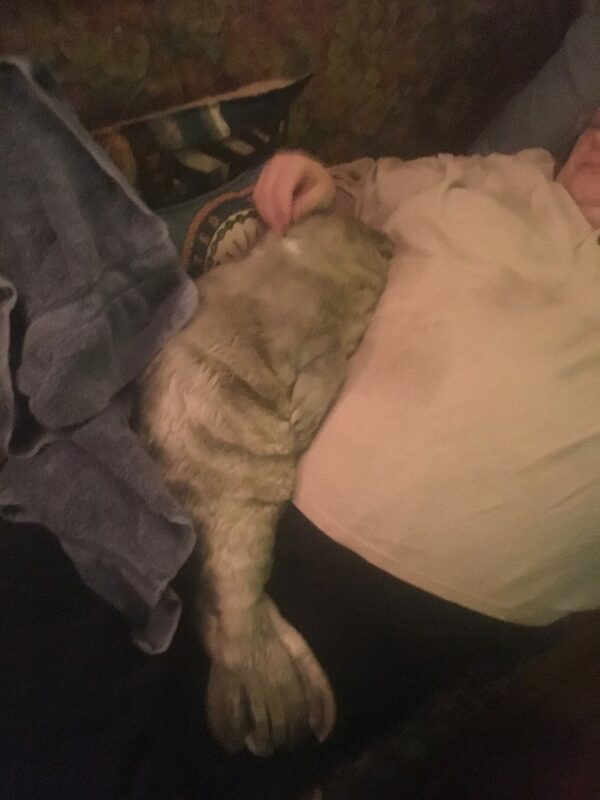 Talking to someone on Monday (we want to find out for sure what the COD was) who said, even though it wasn’t one of her days to volunteer, she had come over to look for him as she lived nearby. One of the problems was, he was small so if he wasn’t somewhere you were looking – very hard to spot. The calls had indicated distress and obvious hunger as he seemed to be trying to nurse off the docks. She had brought a big towel to wrap Lil’ Bud in, so Kyle came down to get him. We were both crying….just couldn’t help it. When Kyle handed him over, she said, “Oh see? The umbilical is still attached. Very likely he got sepsis – it happens far too often.” She talked more about how fragile they are as such young pups and that, if they can’t intervene soon enough there just isn’t much to do. Many of the pups they do rescue have to be fed intravenously for a while until they can get their strength up. We asked if we could find out what caused his death, and she said that would absolutely be appropriate…but that it likely wasn’t anything we had done. Kyle talked to Ron again on Monday afternoon. Ron said he had been there when Lil’ Bud came into the center and he looked so peaceful. The whole center was bawling I guess, the story really touched them as well. They thought it was great and how lucky we were to have had that interaction – and that he hadn’t drowned alone and freaked out, but cared for and comfortable. That’s all nice but doesn’t make it easier. 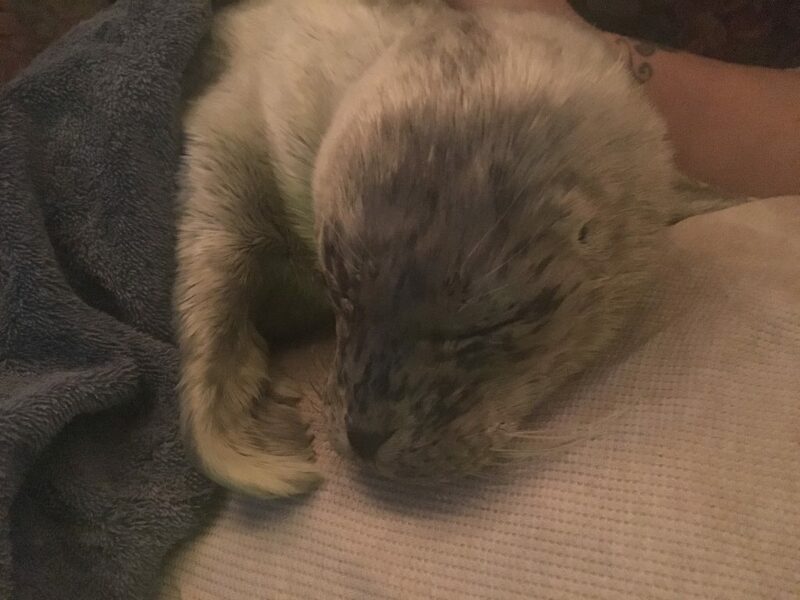 As of Monday afternoon, they didn’t have an absolute answer for COD – but malnutrition (he had been many hours since he nursed so his mom had abandoned him early in the day Saturday) and just exhaustion. He was too small to get up on the docks to rest and probably got turned around with all the boats and docks so couldn’t find the few shallow spots of land around the marina.